Hopfen: Cascade, Magnum Malz: Weizen-, Wiener, Karamellmalz Indra is a new beer style that fuses hoppy, aromatic character of American IPAs and the distinctive banana and clove Aroma of German wheat beers. The hop of choice was the American Cascade. Virtually no other hop is able to produce such a perfect contrast and balance with the intense wheat flavor. Indra vereinigt das typische Aroma von Banane und Nelken eines Weizenbieres mit dem hopfengeprägten Charakter eines IPAs. Als Hopfen wurde der amerikanische "Cascade" verwendet. Kaum ein anderer Hopfen ist in der Lage, ein so perfektes Gegengewicht zu dem intensiven Weizenaroma zu bilden. UPDATED: DEC 9, 2018 Bottled 330ml (AIH91)<br / Amber colour, small steady off-white head. Jam, harshness and bretta in the nose. Medium-bodied. Sweet ... banana, harsh yeastyness, grass, alcohol in the flavour. Jammy. Some citrus hops. Probably gone a bit off. 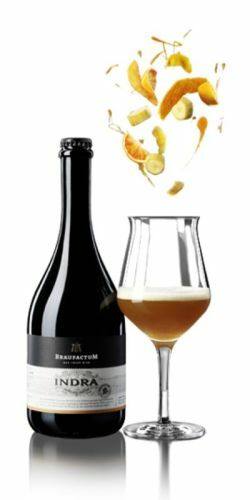 Billed as a mixture of German Weizenbier and American-style IPA flavours, this brew is orange, cloudy and boasts a good head. I detect strawberries and bananas in the aroma... along with something I can only describe as cherryade (but the overall effect is rather good). The taste is well matched to the aroma: good bitterness with a sweet-sour edge and a fruity finish. I find this beer rather enjoyable. 330 ml bottle. (Real) Freiburg im Breisgau, Germany. Enjoyed on October 6 2018. Hazy amber color with a small off-white head. Fruity hoppy and yeasty aroma. Nice! The flavor is sweet fruity hops, caramel malt and some yeasty notes. Balanced and tasty. Sweet! Bottle. Hazy amber colour with a medium off-white head, nose is citric, yeasty, spicy and slightly malty with notes of grapefruit, mango, passion fruit, cloves and vinegar, taste is slightly sweet, citric and yeasty with a more tart than dry and a bit boozy and zesty finish. Bottle thnx to Kurt. pours daek, rather unclear copperamber. Small white fluffy head, medium stability. Smell is fruity. i do get the cloves from the yeast, Yet banana is more to the background. Fruityness is provided more by the hops, than the yeast here, making it more 'bright' rather than the ' heavy' esters. Taste is intense, bitter, bit dry even due to the bitterness and rather high carbonation. But the finish isn't dry. The yeast takes over (phenols, providing the clove factor ) and the beer turns rather creamty (like a weisse, rather than a NEIPA ) Wheat is noticable . Nort bad at all. Perhaps not my favorite hybrid though…But you gotta admit, they had a plan, and executed acordingly, and succesfully ! Amber, hazy, stable creamy head. Aroma: mix of banana weizen notes and sweet citrusy hops. Taste: light tartness, light bitterness. Lemony flavour. Good. Bottle. Dark amber orange, fluffy head. Mango, pine, honey, spicy hops, some caramel. Hoppy bitterness, some malty sweetness. Medium bodied, soft carbonated, dry finish. More an APA than a wheat ale. Bottle from Galeria Kaufhof, Alexanderplatz. Light amber with a large head. Aroma and taste of grass, light banana, citrus and light bread. Soft and easy to drink.